Installing DWLBC and DEH signage along the Peake Public Access Route and DEH signage at the ruins of the Hammer and Gad Eating House. Re-locating an S Kidman & Co sign at the Hemichroa (Shrubby Pig Face) enclosure at Strangways. With the extensive recent rains, the group found the country to be in very good heart. Logistically, this had its pros and cons, as indicated below. 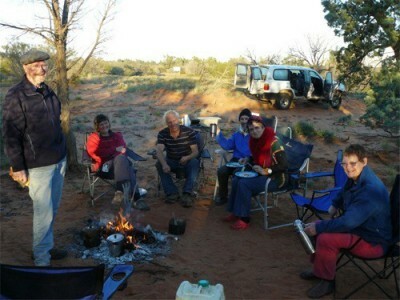 Several members of the group converged on Roxby Downs: John and Leigh via Coober Pedy, Brendan and Elizabeth via Bon Bon Station and Elaine, Bill and Simon from Adelaide. With rain falling, they were confronted by a “road closed” sign on the Borefield Road and so had little option other than to bunker down in the Roxby Downs Hotel / Motel for the night. 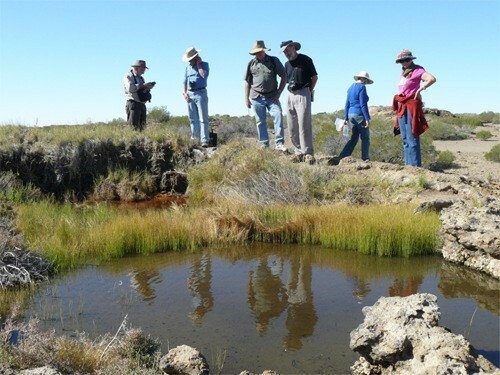 In the meantime, Anne, Bjarne and Michael were travelling up via the Flinders Ranges, with a view to meeting the group at Coward Springs on Monday. A fine morning in Roxby Downs but as the group coffeed in the sun at the Dunes Café the report came through that the Borefield Road would remain closed until at least Tuesday 18th. The group made good use of the spare afternoon with a trip to Andamooka and then camped on Lake Mary (between Roxby Downs and Woomera) for the night. Meanwhile, Anne, Bjarne and Michael made it through to Coward Springs Campground (via Marree) and waited patiently for everyone else to catch up. 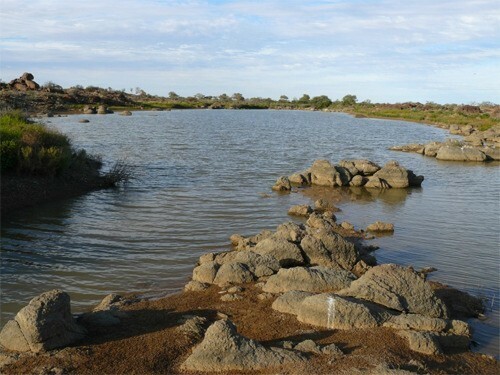 Bruce and Sherrie commenced their trip from Adelaide, overnighting at Mambray Creek. Good news at last for the Roxby contingent – the Borefield Road opened for 4wd traffic. This group and the Jensen group rendezvoused at Coward Springs for lunch, before heading for William Creek – the Jensens travelling gingerly with their conventional A-van in tow. At William Creek we were pleased to be caught up with by Bruce and Sherrie and progressed on to the Peake Public Access Route (PAR), with the Jensen van bringing up the rear. At the entrance to the PAR, there was just enough daylight left for the installation of the PAR sign provided by DWLBC – a good example of “many hands make light work”. Then on in the darkness to the camp-site near the Peake Repeater Station ruins. Anne and Bjarne (BJ) finally emerged through the range, with BJ muttering “never again!” in terms of bringing the A-van into this terrain. A fine and enjoyable day with the signs being installed and the trail interpretive work being completed by a late lunch-time. A free afternoon for all with one group looking more closely around the ruins etc, while a second group went for a hike over to Peake Creek: lots of free-standing water and lots of interesting vegetation. A second night spent at the Peake. A slight split in the party as Brendan and Elizabeth head north towards Dalhousie and the rest head south towards the Peake homestead. 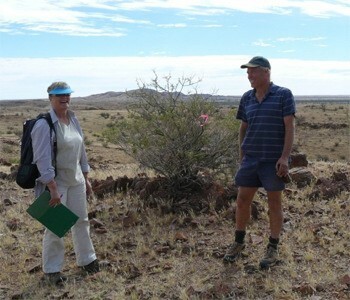 BJ and Michael decide to head straight down the Oodnadatta Track with the van and to wait for the group at William Creek. At Peake homestead the group is greeted hospitably by Karen Durbidge, with the news that a “big rain” is moving in as from Friday afternoon. This instils a little urgency into the group and we head out to inspect Outside, Twelve Mile and the Fountain springs – for some discussion with Anne about springs management and for Bruce to do some maintenance work on the bayonet gates. Later, after a quick search for Bruce’s wallet on the Douglas, the group arrives at William Creek in late afternoon and, re-united with BJ and Michael, heads down to Strangways Springs to camp for the night. 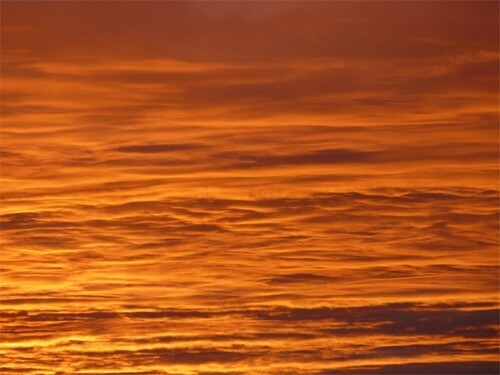 That night we are somewhat reassured by news on the satellite phone from our weather guru Colin that rain is not expected the following day. Another fine day dawns. 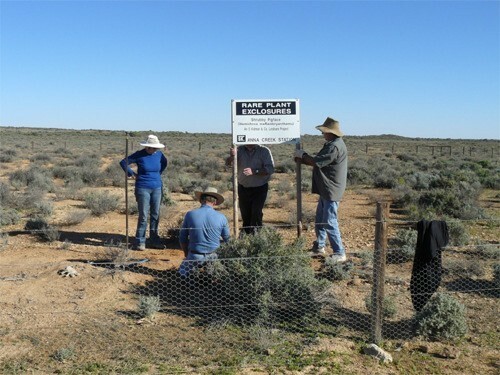 The group’s first job is to relocate a sign at the Hemichroa enclosure (as requested by Greg Campbell of S Kidman & Co) and most of the group is happy to supervise the efforts of Bruce and BJ with crowbar and shovel. Then it is on to the proposed interpretive trail with Anne providing expert comment on points of natural history interest. After a late lunch at the campsite we make our farewells as the formal part of the FOMS trip comes to an end. Bruce and Sherrie, John and Leigh and the Jensen clan head to Marree and beyond, while Elaine, Bill and Simon venture back towards Roxby Downs to retrieve their vehicles. In summary, a great trip with a very compatible group of people pitching in and adapting well to the difficulties imposed upon us by higher influences. Many thanks to all concerned – we got the jobs done and had a great time.